Gold Honey distills the essence of the highest quality orange blossom honey in the world. This sweet honey flavor is complimented with well-aged tobaccos, creating a fusion of heavenly perfume and subtle earthiness. 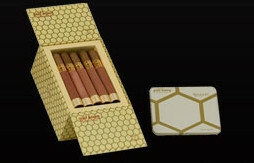 Sweet honey and fine tobacco come together in a very aromatic cigar. Perfectly sized for 30-40 minutes of smoking pleasure. Sweet honey and fine tobacco come together in a very aromatic cigar. Not too long, not too fat! A favorite among the lady smokers. Sweet honey and fine tobacco come together in a very aromatic cigar. Perfectly sized for 10-20 minutes of smoking pleasure. Each tin contains 10 cigars. Sweet honey and fine tobacco come together in a very aromatic cigar. An intricate blend of natural exotic fruit and bourbon vanilla. Bourbon vanilla is mixed with Georgia peaches and other organic fruits, then splashed with the tropical essence of white Hawaiian honey. Probably the best honey flavored cigar on the market. Sweet, aromatic and medium bodied. Excellent! You MUST TRY if you love honey!